For the collectors amongst us, Pelikan began issuing the Special Edition M101N series as a throw-back to a line that was originally introduced in 1937. 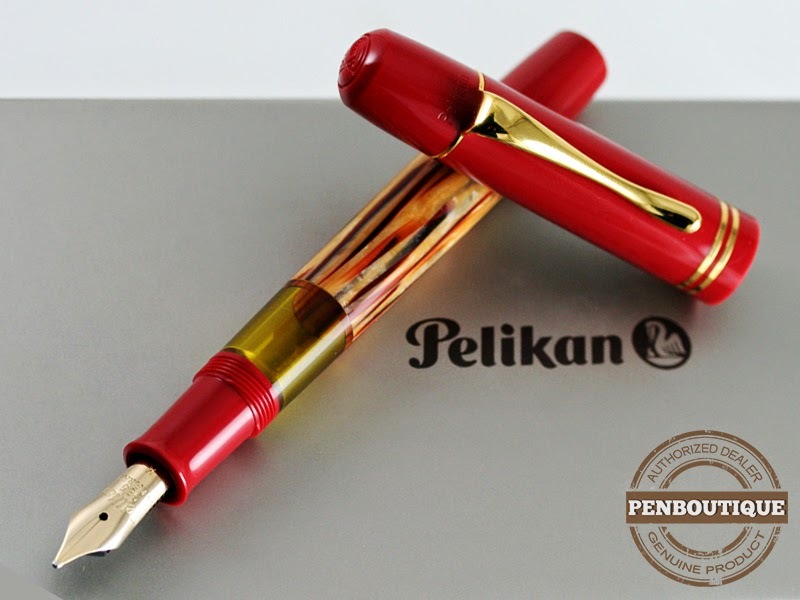 Now in its third Special Edition iteration, the Pelikan Souverän M101N Tortoisehell Red is the latest version to come out of Germany. These Special Edition pens pay homage to the lines and shape of the original piece while utilizing the best in modern technology and materials. The body itself is made of cellulose acetate and has a somewhat striated design with differing shades of brown inlaid on an almost creamy parchment brown. The cap, front section and rear section are a red resin and help to set the piece apart from the more subdued colors of the other two Special Editions. The nib is 14k gold and, like their other pieces, is easily removed for cleaning/swapping/etc. However, these nibs do have a vintage looking engraving which sets them apart from normal Pelikan nibs. The pen is piston filled and for a limited time will have a bottle of Pelikan 4001 Blue ink included. There will be historic font lettering on the bottle and presentation box. In a collection that spans up to the extra large M1000, the M101 line is Pelikan’s smallest offering. It is a handy pen, something that could easily be put into a shirt pocket or bag and be available at a moment’s notice. It is also a light pen, mainly due to the materials from which it is manufactured, so it shouldn’t be a burden when carried. The large ink reservoir window aids in keeping track of your ink supply and the 14k gold nib ensures a smooth ink-to-paper writing experience. The removable nib helps to make certain that you have a completely clean pen when changing inks, something which will be of great value to those who like to change or experiment with different colors. I found that holding the pen was comfortable with the cap either posted or completely off. While the pen is shorter than most, I did not find its size to be a detriment to its use. The M101N Special Edition Tortoiseshell Red fountain pen is a good addition to Pelikan’s growing stable of fine writing instruments. It has taken a proven historic design and updated it for today’s demanding users. For those that like a vintage look with the added benefit of modern manufacturing or are just looking for a great writing pen, the Pelikan M101N Special Edition Tortoiseshell Red fountain pen should be high on your list of pieces to check out. Make sure to act fast as the special Blue ink bottle is only available for a limited time!